extreme plasma physics > Visualizations > Speiser and Dahu orbits: the trappings that heat you up! Speiser and Dahu orbits: the trappings that heat you up! Figure 1: Speiser and Dahu orbits: the trappings that heat you up! High-energy particles are ubiquitous in the universe, from jets at the center of the galaxies to the Solar Wind. Understanding the different mechanisms responsible for this acceleration is one of the most challenging questions of contemporary plasma studies. The standard approach to address this question is using kinetic models, both numerical and theoretical, in order to deeply understand the dynamics of the particles involved. Figure 1 shows the result of a numerical simulation of a collisionless plasma performed with the particle-in-cell code OSIRIS 4.0 in which is represented one mechanism for thermal acceleration (heating). As the title says, this mechanism is connected with the trapping of particles between two approaching current sheet profiles. Figure 2: (Top) Radial current jx (black) and toroidal magnetic field By (blue) profile. The dashed gray lines delineate the regions of the different particle trajectories: the Speiser orbit (red), and the Dahu orbit (green). Following the time evolution of the system (grey arrow in Figure 1), we observe that the current sheets (colored surfaces) approach each other until merging in a single, high-intensity profile. The schematic representation of the current sheet is shown in Figure 2, which shows the spatial distribution of the double current sheets profile (black). 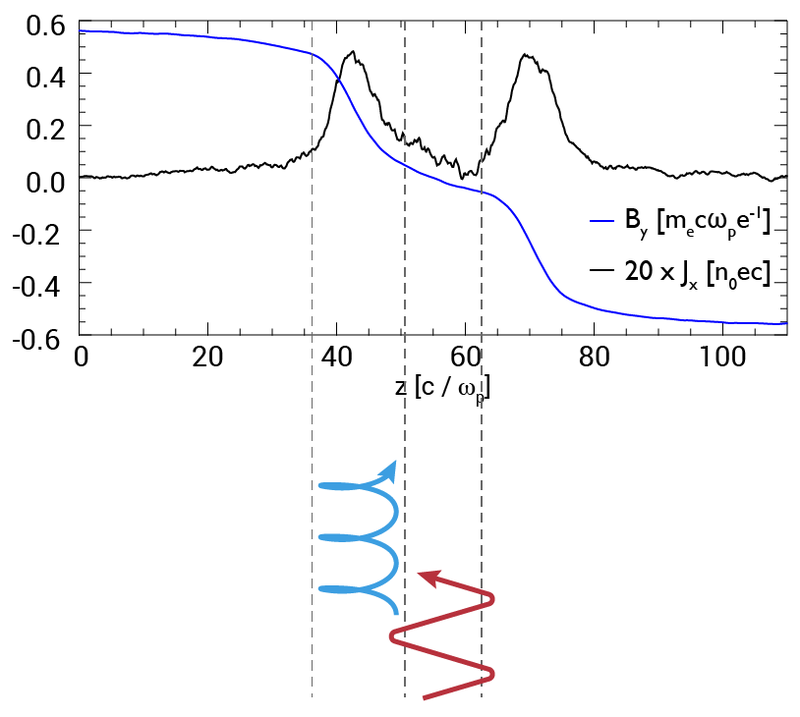 This profile in the plasma current is the result of an external non-uniform magnetic field (blue), always perpendicular to the current sheet formed. The dashed lines in Figure 2 delimit two different regions that influence differently the dynamics of the particle: the first region is the internal one, in which the profiles of both the current and magnetic field is almost null. In this region, the particles are trapped to bounce between one current profile to the other, following a trajectory called Speiser orbit, as indicated by the red curve in Figure 2. The other region is the gradient one, in which the variation of the magnetic field is stronger. In this region, we observe that the particles follow another kind of trapping trajectory (light blue) that we called Dahu orbit, named after the fantastic animal of the Alps that cannot descend the ridge of the mountains (see the illustration in Figure 3). 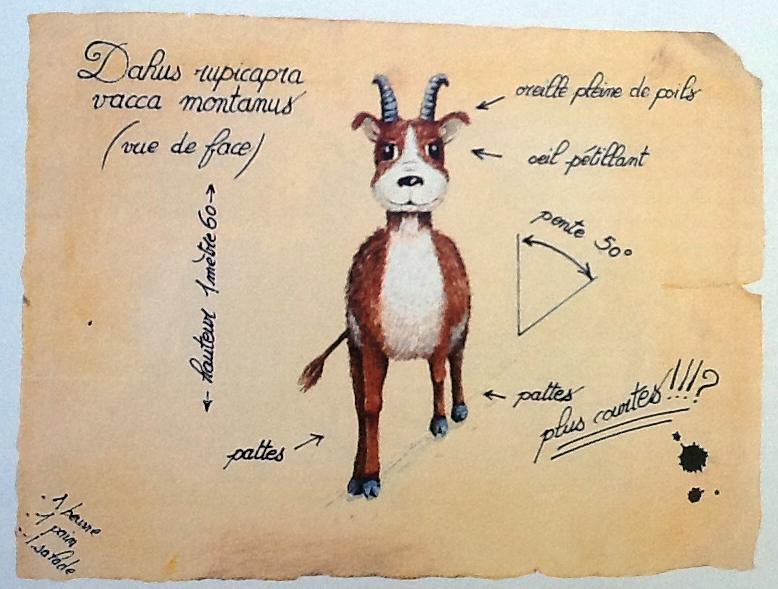 Figure 3: Artistic representation of the Dahu, fantastic animal of the Alps © Guida della Valle d’Aosta. Both orbits are represented for an ion in the sample trajectory shown in Figure 1, in particular, the alternation between Speiser (yellow initial part) and Dahu (greenish). Since the ion is trapped, it is constrained to follow the evolution of the current sheets, gaining energy at each bounce. 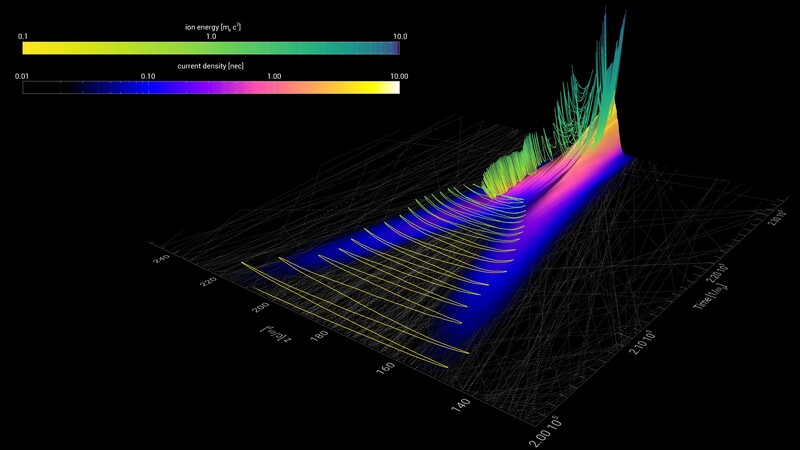 For simplicity, we decided to show only one ion trajectory in Figure 1. However, the trapping mechanisms and their relative orbits are common in all the ions that are trapped between the current sheets profiles evolution. In particular, further theoretical and numerical analysis has shown that the heating mechanism described is more effective for the ions than for the electrons. For this reason, we observe an enhanced ion eating with Ti > Te at late stages of current sheets formation, as shown in Figure 4. 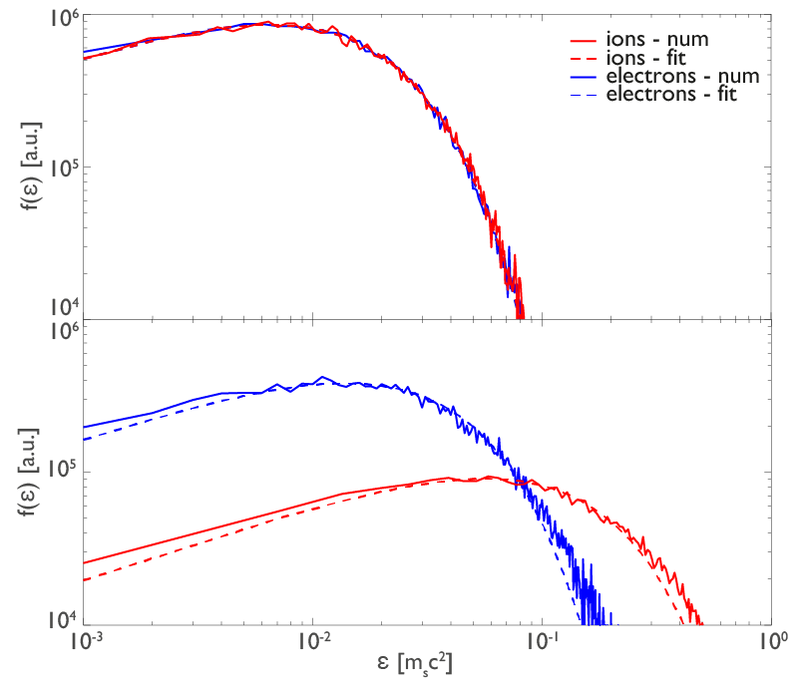 Figure 4: Kinetic energy distribution function for the ion (red) and the electron (blue) species at two different times. The solid lines represent the numerical results, whereas the dashed lines represent the fitting with a Maxwellian distribution. The results obtained can help understand better the first principle mechanisms beyond a series of astrophysical scenarios in which we observe a difference of temperature between the two plasma species, for example, the collisionless accretion disks around supermassive black holes, such as Sag A* (the one in the center of our galaxy). The growing interest for the study of these astrophysical scenarios will increase the possibility to compare these theoretical and numerical work with the observations, thanks to the upcoming data of the Event Horizon Telescope. For more information, see G.Inchingolo, et al., BO8.00007, 60th Annual Meeting of the APS Division of Plasma Physics, (2018), more details here.